Louisiana Tech University has entered into a partnership with global IT leader Computer Sciences Corporation (CSC), Louisiana Economic Development (LED) FastStart, and the Cyber Innovation Center in Bossier City to offer current and prospective students a comprehensive suite of cyber-related programs and career opportunities designed to meet the current and future needs of CSC. Governor Bobby Jindal made the announcement Tuesday at the Cyber Innovation Center (CIC) where CSC will establish a 116,000 square-foot technology center that is expected to have an 800 direct jobs impact statewide, within the next four years. Louisiana Tech President Les Guice and Vice President for Research and Development Stan Napper were also in attendance along with representatives from CSC, CIC, LED and business and community leaders throughout north Louisiana. “Today is a culmination of efforts, but it’s also a beginning or what we in higher education call a ‘commencement,’” said Guice during his address to the attendees. “This partnership is going to have an enormous impact across this region and across this state. It’s an excellent opportunity for Louisiana Tech students and graduates to work with a premier technology company with leading-edge tools and resources to help solve some of the world’s most complex problems. Using its academic and certificate program strengths in areas such as computer science, computer information systems and cyber engineering, Louisiana Tech will produce graduates with skills that closely align with the needs of CSC while offering graduates unprecedented career opportunities in north Louisiana. The partnership also seeks to expand the state’s knowledge economy by keeping more of its top graduates, from high-tech and high-demand fields, working within Louisiana. Headquartered in Falls Church, Va. and with major offices in Australia, Asia and Europe, CSC has over 80,000 employees serving clients in more than 70 countries. CSC is a global leader in next-generation IT services and solutions with a mission to enable superior returns on clients’ technology investments through best-in-class industry solutions, domain expertise and global scale. CSC’s new center will become an anchor tenant of the 3,000-acre National Cyber Research Park in Bossier City which is being developed by the CIC. CSC selected Bossier City following a competitive site-selection process during which the company considered 134 locations around the country. In addition to providing 40,000 square-feet of temporary operating space for CSC, the Cyber Innovation Center will support the development of the new technology center and manage the facility after its construction at the National Cyber Research Park. Louisiana Tech and the CIC have enjoyed a strong, collaborative relationship over the past several years. The two organizations have shared in the development and advancement of programs and partnerships such as the Cyber Discovery Camps, the Cyber Engineering Research Conferences, and Science, Technology, Engineering and Mathematics (STEM) initiatives built to create the next generation of scientific thinkers and innovators in north Louisiana. The CIC serves as catalyst for the development and expansion of a knowledge-based workforce throughout the region. CIC also seeks to diversify the region’s economic base by promoting research, education, and technological innovation and fostering collaborative and strategic alliances between governmental agencies, private industry, and academic institutions. The State of Louisiana will provide $14 million in funding over 10 years to expand higher-education programs designed primarily to increase the number of annual graduates in computer science and cyber-related fields. Louisiana Tech will receive at least 65 percent of these program expansion funds, which will help it work toward quadrupling its total undergraduate degrees awarded annually in computer science, computer information systems and cyber engineering over the next five to six years. For more information on Louisiana Tech’s computer science, computer information systems, and cyber engineering programs as well as the partnership with CSC and the opportunities that await prospective students and graduates, please visit http://ace.latech.edu and complete an online Expression of Interest form. Interested parties can also contact program coordinators via email at ace@latech.edu. Nearly 1,000 friends, colleagues and members of the campus and local communities gathered in Louisiana Tech University’s Howard Auditorium Tuesday, to celebrate the investiture of Dr. Leslie K. Guice as Louisiana Tech’s 14th president. University of Louisiana System President Dr. Sandra Woodley officially conferred upon Guice the office and authority of the presidency and was joined by University of Louisiana System Board of Supervisors Chair E. Gerald Hebert to present Guice with his presidential medallion. Members of Guice’s family including wife Kathy, mother Marguerite, brother Gary and family, and sons Kyle, Chad, and Bret and their families were on hand to witness this historic event. 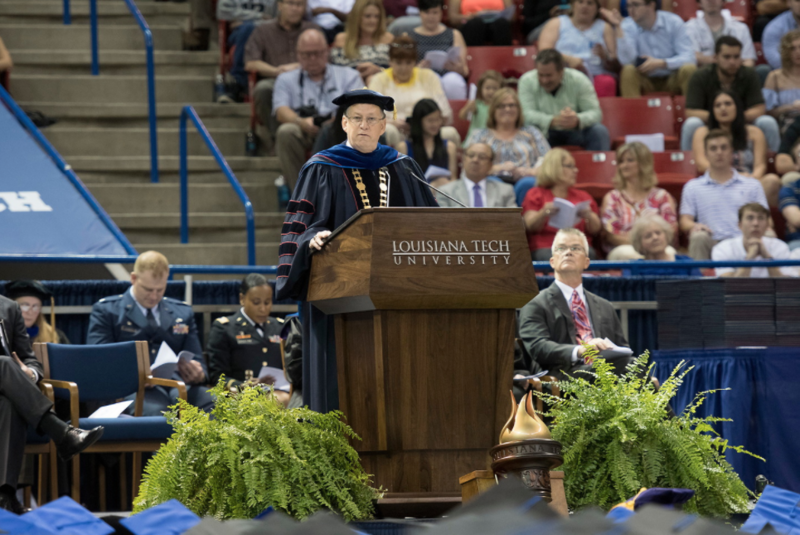 This was the first presidential investiture conducted at Louisiana Tech since 1962 when Dr. F. Jay Taylor assumed the presidency of what was then Louisiana Polytechnic Institute. Dr. Daniel D. Reneau succeeded Taylor as president in 1987, but did not have an investiture ceremony. Guice is just the third president in the past 52 years to lead Louisiana Tech. Shortly before the investiture ceremony, Guice and family participated in the planting of his presidential tree along the alumni walkway leading to Centennial Plaza. The red maple joined those of the other 13 Louisiana Tech presidents, representing strength and stability in leadership at the university throughout its 120 history. “The stability of and confidence in presidential leadership as well as the tremendous commitment, integrity, and enthusiasm demonstrated by my predecessors has enabled Louisiana Tech to distinguish itself as a national university most effectively serving the citizens of the State of Louisiana,” Guice said. Guice assumed the presidency of Louisiana Tech on July 1, 2013, succeeding Reneau, who had led the university for 26 years and retired as the longest tenured president in the history of the institution. Following a national search and a series of public forums and interviews, the University of Louisiana Board of Supervisors unanimously appointed Guice as Louisiana Tech’s 14th president in a special session in Baton Rouge on December 4, 2012. In his address, Guice credited Reneau with transforming the campus, from its facilities, to its academic programs, to its athletics programs, to its research programs, bringing Louisiana Tech distinguished state and national recognition, and ultimately leading to its designation as a national research university by the Carnegie Foundation and a top tier ranking among national universities from U.S. News and World Report. Despite his sincere appreciation for his supporters and the accolades he received during the investiture ceremony, it didn’t take Guice long to look toward the future and share his vision for elevating Louisiana Tech to a position of even greater national prominence. Guice said that Louisiana Tech’s future success will be achieved largely through its comprehensive strategic plan with a focus placed on student recruitment and retention, innovative curriculum design and interdisciplinary student experiences, the elevation of research program to national prominence and maximizing the economic impact of Louisiana Tech’s innovation enterprise. He also emphasized the importance of private support and strengthening public-private partnerships in Louisiana Tech’s long-term growth strategies.